Located in Central Vietnam Hué is an ancient Imperial City under the Nguyen dynasty during the 17th and 18th centuries and was the first national capital of united Vietnam. With UNESCO World Heritage Site status, Hué is perhaps best known for its citadel boasting a prominent flag tower. Within the walled fortress and palace there is an imperial enclosure called the Purple Forbidden City, which is a nostalgic memoir of the Nguyen dynasty. The Thien Mu Pagoda (translated as the “Heavenly Lady”) is well worth as visit, as are the two royal tombs that house the former emperors of Vietnam. We recommend enjoying time with a historian to enrich your cultural experience. It is well worth visiting this architecturally charming city by bicycle. 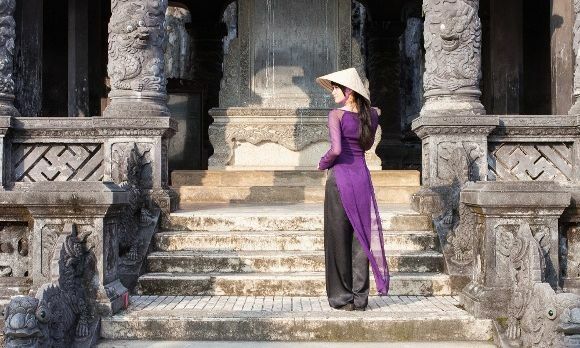 Whilst bustling with ancient historical sites to explore, you can also enjoy a Vietnamese cookery class that includes ornate vegetable carving or a hands-on painting experience, visit a Buddhist monastery, explore Hué Garden House. Go on a dinner cruise or visit a local school. Little ones can also go on an elephant ride! With the poetic nature of the deep-blue Perfume River that winds her way through the city, it’s also a noted literary center. Like throughout Vietnam, Hué is devoid of international brands such as Starbucks and McDonald’s providing truly authentic experiences for your food choices. However we also recommend some romantic, fine dining experience to feast your eyes upon. Undoubtedly the best local restaurant, you can enjoy the delicate sweet and spicy flavors and an abundance of fresh produce and seafood that characterize the region, as well as wide range of innovative fusion cuisine. A fifteen minute drive from downtown Hué the restaurant is housed within an original royal ancient house, there is a real ambiance as if you are dining at a palace. Le Parfum chefs use the freshest market ingredients to create delicious local, regional and international dishes. The airy high-ceiled dining area enjoys views across the Perfume River to the Imperial Citadel, and the well-clipped garden surrounds of La Residence makes for a fantastic ambiance. Minutes from the beautiful Perfume River, the Citadel, Royal Tombs and the pinnacle Dong Ba Market sits this wonderful boutique hotel of just 12 rooms. Warm hospitality, modern facilities including a restaurant offering both Western and Vietnamese specialties provide superb comfort after a day’s sightseeing. Once the residency of a French Colonial governor this larger boutique hotel flawlessly combines modernity with nostalgia, whilst using local materials. Right on the banks of the fabled Perfume River with breathtaking views across to the Citadel, La Residence takes you into the golden age of art deco with opulence and warmth in this 1930s design hotel. 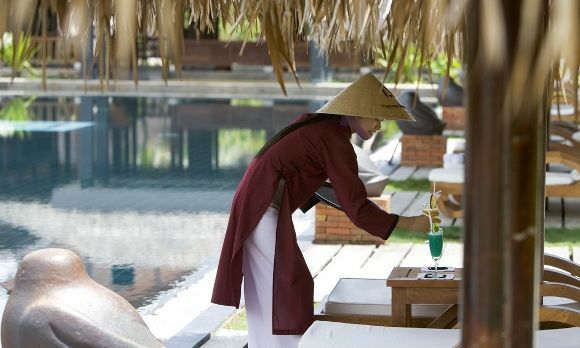 This traditionally styled Vietnamese boutique resort is tucked within the surrounding countryside of Huè. With lush, tranquil gardens, a spa and a restaurant set beside a lily lake that specializes in Vietnamese fusion cuisine, this is a wonderful venue to relax in away from Huè’s historical landmarks. Whilst shopping is not what Hué is best known for, but there are a couple of gorgeous stores to explore. Beautiful decorative items created from thousands of shimmering stitches. An excellent gift shop at La Residence hotel boasting lavish hand-embroidery and exclusive products from fine woods, quality fabrics, metals, ceramic, horn and other precious material. Selling beautiful handicraft and eco-friendly gift items produced by disabled students. All proceeds return to fund these artisans as well as heart surgeries for poor children in Vietnam.